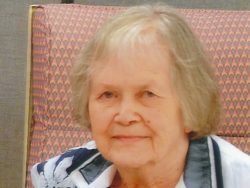 Inez Burke - Heritage Funeral Homes Inc.
of Kenilworth passed away peacefully at the Caressant Care Nursing Home, Harriston on Friday, March 1, 2019 in her 88th year. Beloved wife of the late Egan Burke (1983). Cherished mother of Rick and Judy Burke of Kenilworth, Joyce and Bob Heans of Fergus, Pat and Michele Burke of Hillsburg, Anne Burke and Ken Parker of Waterloo and Jerry and Heather Burke of Orangeville. Mother-in-law of Jill Burke of British Columbia. Grandmother to her 13 grand and her 10 great grandchildren. Sister-in-law of Kay Lehman of Mount Forest Teresa Lehman of Palmerston and Mike and Marg Burke of Whitby. Fondly remembered by her nieces, nephews and friends. Predeceased by her son John Burke (2018), parents Alfred and Hilda (Diemert) Lehman and brothers Harold and Cyril Lehman. The family will receive friends at the Crawford Funeral Chapel, 243 George Street, Arthur on Wednesday, March 6, 2019 from 2 to 4 and 7 to 9 p.m. The Funeral Mass will be Celebrated in Sacred Heart Church, Kenilworth on Thursday, March 7, 2019 at 11:00 a.m.
Spring interment in Sacred Heart Cemetery, Kenilworth. As expressions of sympathy donations to Sacred Heart Roman Catholic Church, Kenilworth would be appreciated by the family. Parish prayers will be recited in the Funeral Home on Wednesday evening at 6:30 p.m.